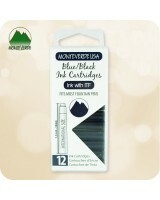 We carry these high quality standard international replacement ink cartridges which fit Aldo Domani Fountain Pens. Currently we offer Monteverde's world's latest leading European ink treatment formula which drastically improves ink-flow quality. If you need a different type of refill, please contact me and I will try to help you locate the refill you are looking for! Require Rollerball Pen Refills or Ballpoint Pen Refills instead?